Forrest Shooster, a first-year game design and development honors student diagnosed within the autism spectrum, works to coordinate class schedules with his peer mentor Amy Dasaro, from the Spectrum Support Program at RIT. Forrest Shooster, a first-year game design and development honors student from Parkland, Fla., got a 4.0 his first quarter at RIT while also pursuing courses for a pre-med track. Additionally, he’s writing a horror/adventure novel, is involved in seven clubs and organizations on campus and is a black belt in karate. Shooster is also part of a growing group of students at RIT—and in higher education across the country—who are within the autism spectrum. Autism, a complex developmental disability that affects a person’s ability to communicate and interact with others, is known as a “spectrum disorder” because it impacts individuals in varying degrees. Autism is the fastest-growing serious developmental disability in the U.S. According to the Centers for Disease Control and Prevention, it affects one in every 88 births. Although there is no known single cause of autism, increased awareness and funding has helped individuals succeed, allowing more of these students to enroll in college than ever before. Students who choose to enroll in the program get to know the campus during a pre-orientation, participate in social events, work on interviewing skills in a specialized career seminar and can meet regularly with peer coaches from RIT’s school psychology graduate program. Peer coaches help facilitate communication among professors, academic advisers and other support systems, while developing social and academic goals for the students. While providing services for students, the program also promotes research in the area, co-hosting an autism spectrum in higher education conference Nov. 7 with MIT and Rensselaer Polytechnic Institute. 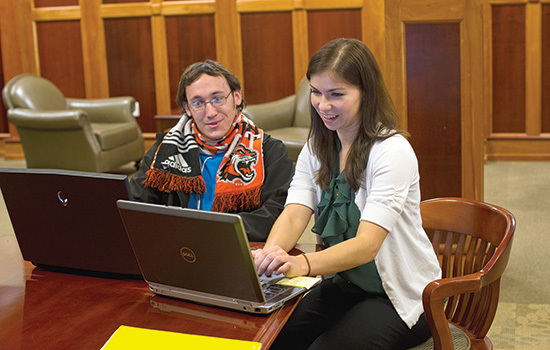 At RIT, the team works to increase awareness throughout the community by educating faculty, staff and resident and orientation advisers about autism. based programs that often require less social interaction.